► Johnson Sirleaf, as we've posted, is the 1st woman to have been elected President of a country in Africa. She's guided her country through difficult times in the aftermath of decades of war presided over by her immediate predecessor, Charles Taylor, who's now in custody at The Hague, awaiting the verdict of the Special Court for Sierra Leone. Johnson Sirleaf, 72, is now in a tough re-election campaign. 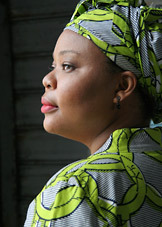 ► Gbowee, 39, is the Executive Director of the Women Peace and Security Network Africa, a Ghana-based organization about which we've posted. In Liberia, she founded a women's peace organization that helped to bring civil war to an end. 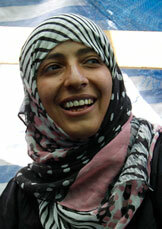 ► Karman (prior post), a 32-year-old journalist and activist mother of 3 children, is the 1st Arab woman to win the prize. She's a leader of the "Arab Spring" pro-democracy movement -- a movement in which, as we've posted, Yemeni women have played a key role. The 3 are the 1st women to win the Nobel Peace Prize since 2004. That year the Committee honored Kenyan Wangari Muta Maathai, who died just days ago.